I can help you with all of these things. 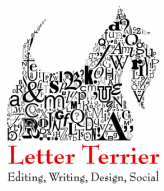 Welcome to Letter Terrier: editing, writing, design, and social media by Jill Walters. I am detail-oriented, dedicated, and ready to assist with your communications projects! Check out my services, get in touch, or find out more.